The Mediterranean Sea is an intercontinental sea situated between Europe to the north, and Africa to the south. It covers an area of about 970,000 square miles, with an average depth of 4,500 feet and a maximum depth of 15,000 feet off the southern coast of Greece. The Mediterranean is an almost completely closed basin where the continuous inflow of surface water from the Atlantic Ocean is the sea's major source of replenishment and water renewal, giving it a high degree of salinity. It is estimated waters take over a century to be completely renewed through the Strait of Gibraltar wich is only 1,000 feet deep. Ancient Osiria, much of which is now submerged, stretched from southern Europe to North Africa, and from the ancient Near East to the Pillars of Hercules. Image and text adapted from Università degli Studi di Pavia. h, Osiria! Ancient enemy of Atlantis, saviour of Europe and Africa, and all who dwelt between the pillars! Once the fertile breadbasket of the world, now sunken beneath thousands of feet of saltwater in the same cataclysm that destroyedAtlantis and the rest of the antediluvian world. You will not find Osiria on any map, nor will you find it in biblical or even most historical literature. Osiria was, like Atlantis, a theoretical empire that happens to fit the facts, whose name has been derived from one of the most ancient gods of the region of the Mediterranean — Osiris. The namesake and founder of the Osirian Empire was the Egyptian god Osiris. In the Egyptian pantheon, Osiris was the son of the gods Nut, goddess of the sky, and Geb, god of Earth. Osiris was married to Isis, with whom he fathered the falcon-headed godHorus. Osiris was also brother to Nepthys, Egyptian goddess of the dead, and Set, Egyptian god of chaos and disorder. A fragment of hieroglyphic writing showing a variation of the name of Osiris. For the ancient Egyptians, the main purpose for writing was not decorative, and it was not originally intended for literary or commercial use. Its most important function was to provide a means by which certain concepts or events could be brought into existence. The Egyptians believed that if something were committed to writing it could be repeatedly 'made to happen' by means of magic. 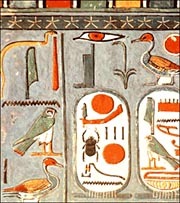 Osiris' hieroglyph, the eye over the throne, usually accompanied by the "god" hieroglyph to indicate deity, is portrayed here with a plant instead, indicating Osiris in his fertility aspect. Image and text from "The Cosmetic Hieroglyph" by Jeremy Lemmon. A fragment from the Egyptian book of the Dead, showing Osiris on the throne, surrounded by Isis, Nepthys, and Horus. Osiris was considered the judge of the dead, deciding who proceeds into everlasting life, or everlasting damnation. Isis and Nephthys aided in this judgement. Image from "The Cosmetic Hieroglyph". Nun, the god of the primordial waters. Nun existed from the beginning, and was the source from which the Egyptians gods came forth. Nun probably represents the waters of the Great Flood, which covered the entire Earth. The coffin in the myth of Osiris might represent Noah's ark, and Osiris might be Ham, the ancestor of the Egyptians (or perhaps one of his descendants) who was "resurrected" from the waters after he exited the ark. Image from Ancient Egypt: The Mythology. The "dying and reviving god" motif that was popular throughout the ancient world had its roots in Egypt, in the worship of the god Osiris. Osiris, the "great architect" of human civilization, came to be the preeminent god not only of Egypt, but famous around the Mediterranean world, including the ancient Near East. It may be, however, that the original "Osiris" was not born in historic times, but in the antediluvian world, and that the "resurrection" of Osiris might actually be a description of the return of the ancient mystery religion — the "mystery of iniquity" — from the world before the Flood. A truth encapsulated in myth, the story of Osiris might actually be the story of a real king who, some time after the Flood, had begun to uncover the old secrets that the Flood had sought to destroy. Perhaps the wooden "coffin" of the Osirian myth was actually what the Bible refers to as "Noah's ark", and Osiris was actually Ham, the ancestral father of the Egyptians — or perhaps his wicked son Canaan, or even Amor, father of the Amorites. This would explain why the most ancient god of the Egyptians was Nun, who is described as the god of the primordial waters from which all other gods came forth. Nun, who was described as an endless, calm sea, may represent the world as it was covered with the floodwaters from which their ancient ancestor, Ham, was "resurrected" via the ark. Later, as Ham's descendants multiplied, they sought to recreate the world as it was before the Flood, actively seeking for the ancient wisdom that had been lost. And from this search, the myth of Osiris was born — full of clues that initiates were meant to use to help them recover the ancient secrets from the world before the Flood. Childress believes that the story of Osiris' death at Set's hands and the cutting up of Osiris' body into exactly 14 parts might have been a clue as to what happened to the ancient empire of Osiria as a result of the Flood: "There are many important themes in the legend of Osiris, including resurrection and the vanquishing of evil by good, and perhaps a key to the ancient Osirian civilization. Were the 14 pieces of Osiris the 14 vestiges of the now flooded land? "8 Though the antediluvian world was destroyed, pieces of it remained — 14 pieces, according to the myth. And an understanding of these "14 pieces" may be the clues necessary to lead us to understanding both Osiris the man, and Osiris the empire. In this four-part series on ancient Osiria, we will cover four major known pieces of the ancient puzzle, starting with Malta — home of the oldest megalithic structures in the world. 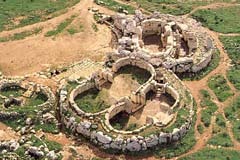 Hagar Qim, one of the more spectacular megalithic temples that dot Malta and the nearby island of Gozo. Hagar Qim, Though not the oldest, is one of the best preserved temple structures to be found on the islands, where several statues of the famous "fat lady" were discovered when the site was excavated around 1850. Image from Heritage Malta. The island of Malta lies in the center of the Mediterranean Sea some 80 miles south of Sicily. Malta, a tiny island only 14 miles long by 8 miles wide, has over a dozen major archaeological sites and a colorful history stretching back many thousands of years, making it the most historically rich country on the planet, per square foot. More importantly to our study, Malta's ruins, located in the dead center of the theoretical Osirian Empire, are the oldest known man-made structures on Earth. Malta's location, the number and size of the megalithic structures to be found all over the island, the level of importance the structures apparently held, and the extreme age of the structures make Malta a likely candidate for the ancient capitol of the now submerged Osirian Empire. The Osirian "Empire" actually made up of a series of allied nations including Athens, Khemet (Egypt), and other nations alluded to but not named by Plato. In the world before the Flood, but the deepest parts of the Mediterranean basin comprised extremely rich, fertile soil, which must have yielded a tremendous amount of produce. The deepest parts of what is now the Mediterranean were then deep, freshwater lakes that served as tributaries to the River Styx. The Styx began its life as what is now known as the River Nile, and then turned west, passing between Sicily and Malta, then south of Sardinia, and then through the Pillars of Hercules to form the Cataract of Hercules, a massive, ten-mile-wide waterfall that emptied into the Atlantic. Image adapted from Università degli Studi di Pavia. According to Childress, the heart of Osiria was a low, fertile valley situated in what is now the Mediterranean basin. This valley was punctuated by a series of large lakes that were linked together by the River Nile, which at that time did not end at the Nile Delta, but flowed into the center of the lush, green Mediterranean basin, turning due west and passing between Malta and Sicily until it became a massive cataract at the pillars of Hercules.9 The temples such as those at Malta were built on the crests of hills overlooking the huge valley and its lakes, serving as both religious and political centers in a peaceful, matriarchal culture. As Childress explains, "What we today call the Maltese Islands, were in those far-off days the peaks of mountains or high ground, and so it is no wonder that these islands are dotted with no less than 9 prehistoric remains. "10Childress also argues that, due to the lack of separation between the continents now caused by the presence of the Mediterranean Sea, Europe, Africa and Asia had formed one huge land mass through which flora and faunae grew and roamed freely: "The continents of Asia, Europe and Africa formed, in those days, one vast land mass. This continent was covered by vast forests and large herds of elephants, mastodons, and other wild animals roamed.... The gigantic walls were built to keep these animals out.11 Thus the massive size of the walls served a practical purpose as well as a religious one. The Cataract of Hercules, once located between the Pillars of Hercules. The Glomar Challenger expedition proved that parts of the Mediterranean basin had once been dry desert, above sea level. This 10-mile-wide channel between the Mediterranean and the Atlantic, now routinely used by shipping, had once hosted a massive waterfall that drained Osiria's River Styx (now "The Nile") into the Atlantic. This waterfall was reversed by the Great Flood, and became the channel through which the tsunami that accompanied the Great Flood washed through and inundated the lowlying areas of the Osirian Empire. This channel remains today as the primary source of water for the Mediterranean Sea, without which it would quickly dry up. Even the high places of Osiria on the peaks of the mountains were not spared the waters of the Great Flood, though their shattered ruins remain today to show us that there was indeed a world before the Flood, a world that was megalithic in stature. Though there were probably numerous megalithic structures of lesser importance in ancient Osiria, the most important were situated at the top of the highest peaks. And since Malta is not only one of the highest peaks that survived the flood, but also the one with the densest population of archaeological artifacts, it stands to reason that it was the most important religious and political center of its time. I say religious and political, as religion and politics at that time were not separated. In our ancient past, the gods of the state were also the rulers of the state, and their priesthoods ruled their lands for them. Also, as numerous ancient cart tracks all over the island attest, Malta was probably also the economic capitol of Osiria, as the majority of the massive amounts of produce brought in for sacrifices to the goddess were sold back to the populace at a profit. Moreover, the priestesses likely had to christen ("Isen"?) new children, as well as perform marriages and funerals and other social functions typically performed by religious leaders in society, making ancient Malta the social capitol as well. Thus, antediluvian Malta was likely the religious, social, economic and political center of the Osirian Empire. The "fat lady" or "Venus of Malta" came in many forms, all grossly obese, indicating a person of immense proportions. Some have argued that the fat lady is actually an androgynous being, pointing out that there are no specific sexual characteristics, whereas others point out examples of the fat lady where sexual characteristics are present. Still others believe that the fat lady was meant to represent the fertile, abundant earth, and sexual identity was not an issue. However, most tend towards the idea that the "fat lady" sat at the center of an ancient matriarchal culture, and was the progenitor of the concept of what we now call "Mother Earth". Image from The OTS Foundation. Our search for the 14 lost pieces of Osiris starts, then, on Malta. But where on Malta? There are numerous archaeological sites all over the island. However, the largest and probably best-known ruins are those ofHagar Qim, which are also the best preserved. Hagar Qim, lit., "erect stones", is made up of several chambers, including an "oracle room", and several altars. 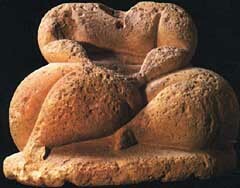 It was there that nineteenth-century archaeologists found the now famous "fat lady" statues, an ancient fertility figure more commonly known as "the Venus of Malta". Based upon this and other discoveries about the religious nature of the monument, it is believed that Malta lay at the center of an ancient matriarchal civilization that worshipped a mother goddess. Hagar Qim and the other structures were in fact temples where this mother goddess — who was essentially an embodiment of the fertility of the land — was worshipped. Moreover, the still-visible ruts of the numerous ancient tracks created by countless carts criss-cross the entire island, some of which are nearly two feet deep. The quantity of tracks on the island makes it clear that the temples once lay at the center of a vast agrarian empire — much larger than the current island of Malta. The numerous cart ruts point to massive amounts of produce being carted into the area from surrounding regions, which makes sense as the temple in ancient times was, besides being the center of religious belief, also the center of commerce. Interestingly, the tracks do not end at the edge of the cliffs that overlook Malta's many beaches, but continue on for some distance into the surrounding ocean, proving that, at the time when Malta's temples were in use, the sea level was significantly lower — or, as we have seen, non-existent in this region. The Gigantija Temple, seen from above. Gigantija was so named as the legends surrounding the temple said that the stones were so huge, the walls so high, and the complex so massive, it could only have been built by giants. Note the curved walls, imitating the ample curves of the "fat lady". Though Hagar Qim is perhaps the most famous and well-preserved of the monuments, the oldest and largest may actually be Ggantija on the nearby island of Gozo. Ggantija, lit., "belonging to the giants", was so named by the Maltese because they believed the huge, megalithic stones used to build the monument could only have been lifted by giants. Some of the walls are as much as 18 feet tall, and very thick, and contain niches and shrines which make it clear that Ggantija, like Hagar Qim was also once a temple. Interestingly, the Maltese do have a tradition of giants on the islands, particularly Gozo. One story, "The Giantess of Qala", talks about a giant woman who lived on the island of Gozo who was able to lift and carry around very heavy rocks. The story appears to describe how some of the monuments were built, though the story might simply be a fabrication created by imaginative islanders to explain the giant "fat lady" statues and the huge rocks that are literally all over the island. However, as we saw in this issue's story on Giants, giants were considered a historical reality not only by the Bible, but numerous other related traditions. If so, the stories about giants building these ancient structures might be true. These ancient master masons may have left their mark all over the ancient world, and Osiris may have been the greatest of these ancient "mighty men" of old. This ancient, peaceful culture, however, met a sudden and violent end, as evidenced by the fact that many of these massive stones have been uprooted and thrown dozens of feet — a feat that would have required forces of incredible magnitude. This was caused by the Great Flood mentioned in the Bible and numerous related legends all over the world, including ancient Athens. Let us look now upon Plato's account of ancient Athens, and its role in the antediluvian "war to end all wars" that raged right up to the time that the waters of the Great Flood covered the entire Earth. In Part I of our series on Atlantis, we discussed Plato'sTimaeus and Critias, ancient Greek poems that contain the famous story of the war between Atlantis and ancient Athens. These poems, set around 600 b.c., relate the story of how one Solon, an important government official from Athens, had visited Egypt with the purpose of initiating a cultural exchange between the two peoples. To his surprise, Solon learned from an Egyptian priest that the Egyptians and the Athenians were once one people, but had been physically separated by a Great Flood that had destroyed all but a handful of the Athenians, the barrier between them being, apparently, a newly formed "Mediterranean Sea". This flood had left Egypt relatively unscathed, however, and so whereas the Athenian Greek culture had been destroyed and its accumulated knowledge lost, the Egyptian culture had remained intact enough so that the tradition of the Flood was not forgotten. Critias contains similar information to Timaeusregarding the war between ancient Athens and Atlantis, but it includes more details about Athens, about its lands and its people, including the fact that Athens and Greece used to occupy a much larger area before a series of floods wiped out much of the lands and sank them into the Mediterranean. However, though Athens existed as a powerful nation around 600 b.c., it actually had its origins well before that time, around 10,000 b.c. or even earlier. This is because the story conveyed in Timaeus and Critias was actually set not during the time of Solon, but some 9000 years before that time — around 9600 b.c., near the end of the last Ice Age. It was the time when the gods were on Earth, breeding and guiding the various races of humanity that had been allotted to them, preparing them for a final battle that would decide who would rule Earth. And of the Olympian gods of Greece, to Athena and her half-brother Hephaestus, were given the Athenians. The gods of the Athenians were Hephaestus, the god of fire, crafts, and the forge, andAthena, goddess of war, as well as of the city, handicrafts, and agriculture. There are interesting parallels between the myths of the Greeks and the myths of the Egyptians, particularly the myth of Osiris. Horus, the son of Isis and Osiris was, like Hephaestus, born with stunted legs. Other interesting Greek/Egyptian religous parallel exists between the birth of Athena and the birth of the Egyptian gods Shu and Tefnut, where all were born directly from a male god, Athena from Zeus and Shu and Tefnut from Ptah, no woman being involved in the birth of either. Could this be support for the opinion that the god/goddess of Malta was actually androgynous, a self-completed human being — capable of self-reproduction — that some have argued was the true deity of Malta and, by extension, ancient Osiria? Athena, her virginity being one of her prime attributes, displays both male and female characteristics, which may point to the fact that ancient Osiria was not only matriarchal in nature, but androgynous. Athens, according to the Egyptian priests was once a much larger area, but was greatly reduced down to its present size by a series of inundations, some of which might have occurred in historic times. This vast, rich, fertile plain had not been supported by solid rock, so when the floods came, the land was washed away, and only that land that lay upon solid bedrock and mountainous areas was kept from sliding into the sea. The Egyptian priest recalled the fact that several major deluges had taken place before and since the Great Flood came 9,000 years previously, as well as other cataclysms of mysterious origin, all of which collectively had kept the Athenians continually struggling to survive. 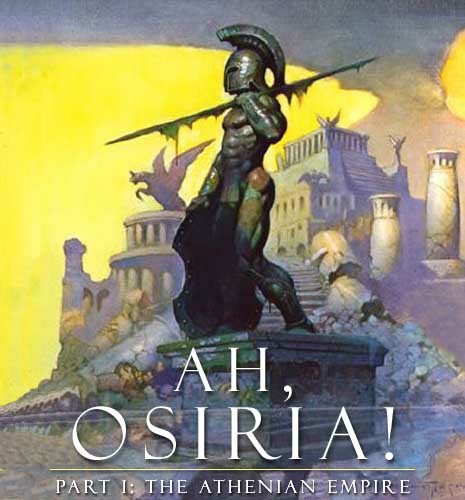 The Athenians had successfully repelled the Atlantean assault upon Osiria, though the rest of their allies who had lived in the region — the proto-Egyptians and the rest of the antediluvian peoples — had failed them. Escaping enslavement to the Atlanteans, however, they were destroyed by a massive flood that had breached the pillars and flooded the entire Mediterranean basin, and possibly more. All that remains today is a relative handful of megalithic remains, with more under the surface, waiting to be found by the next generation of intrepid explorers. The search for the ancient Osirian Empire — and for the 14 lost pieces of Osiris — starts on the island of Malta. Long a favorite tourist destination for Europeans, Malta is fast becoming a world-class premiere tourist destination not only for its megalithic architecture, but for its other historic features, such as the Templar castles and other remnants of the age of chivalry, as well as its top-flight restaurants, entertainment, and accomodations. Ancient secrets may lie waiting to be uncovered, both above ground and below water (though only experienced divers should attempt any underwater archaeology). For more information on your Malta vacation, contact VisitMalta.com. Become a part of the legend! Send us your tales of your search for the 14 lost pieces of Osiris, and you may have your story published in future issues of Mysterious World! 1 David Hatcher Childress, Lost Cities of Atlantis, Ancient Europe & the Mediterranean(Stelle, IL: Adventures Unlimited Press, 1996), 30. 2 Childress, Lost Cities of Atlantis, Ancient Europe & the Mediterranean, 27. 3 April McDevitt, "OSIRIS (Asar, Wesir, Ausar, Unnefer)" (Ancient Egypt: The Mythology: http://www.egyptianmyths.net). The word "Egyptian" is actually also a Greek corruption — the Egyptians actually referred to themselves as being from the land of "Khemet". This is confirmed by the Bible, as this name is very similar to the name of Ham, son of Noah, from whom the Egyptians were said to have descended. 4 TourEgypt.net, "Osiris, Asar" (TourEgypt.net: http://www.touregypt.net). 5 April McDevitt, "OSIRIS (Asar, Wesir, Ausar, Unnefer)" (Ancient Egypt: The Mythology: http://www.egyptianmyths.net). 6 McDevitt, "The Story of Isis and Osiris" (Ancient Egypt: The Mythology:http://www.egyptianmyths.net). 7 Mike Ward and Chris Ward, "Osiris" (University of Colorado: Social Science Data Lab: http://sobek.colorado.edu/LAB/GODS/index.html). 8 Childress, Lost Cities of Atlantis, Ancient Europe & the Mediterranean, 29. 9 Samuel W. Matthews, "This Changing Earth", National Geographic Vol. 143, No. 1, (January 1973): 20-21. Cf. also Kenneth J. Hsu, The Mediterranean Was a Desert: A Voyage of the Glomar Challenger (Princeton: Princeton University Press, 1983). 10 Childress, Lost Cities of Atlantis, Ancient Europe & the Mediterranean, 205. 11 Childress, Lost Cities of Atlantis, Ancient Europe & the Mediterranean, 205. 12 Graham Hancock, Underworld (New York: Crown Publishers, 2002), 20. 13 Childress, Lost Cities of Atlantis, Ancient Europe & the Mediterranean, 206. 14 Plato, "Critias: Page 2", (The Active Mind: http://www.activemind.com). 15 Plato, "Critias: Page 3", (The Active Mind: http://www.activemind.com). 16 Plato, "Timaeus: Page 2", (The Active Mind: http://www.activemind.com). 17 Plato, "Timaeus: Page 2", (The Active Mind: http://www.activemind.com). 18 Plato, "Timaeus: Page 2", (The Active Mind: http://www.activemind.com).